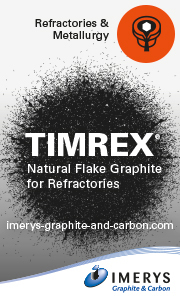 Imerys completed the acquisition of Kerneos/FR, world leader in high performance calcium aluminate binders. With EUR 417 million revenue and EUR 99 million EBITDA in 2016, Kerneos develops high performance binders that contribute key properties (rapid hardening, self-leveling, sealing and wear, corrosion or heat resistance) to its customers’ innovative solutions for construction (screed and adhesive tiles mortars, etc. ), civil engineering (sewage system infrastructure, etc.) or refractories (protection of blast furnaces, thermal power plant, etc.) sectors. Vesuvius plc/GB, a global leader in molten metal flow engineering, announced that Patrick André, President Flow Control, succeeded François Wanecq, who retired, as Chief Executive with effect from 1 September 2017 and joined the Board of Directors of Vesuvius plc. 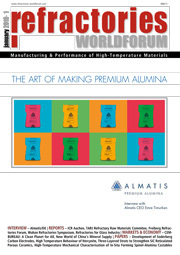 Alumina production has suffered over the past months from significant cost increases which cannot be absorbed anymore. In a very tight market environment, Alteo raiseed prices on its whole product portfolio. The extraordinary general meeting of RHI AG approved the spin-off of all significant assets of RHI AG to its wholly-owned Austrian subsidiary RHI Feuerfest GmbH and the subsequent cross-border merger of RHI AG with its wholly-owned Dutch subsidiary RHI-MAG N.V. with a majority of more than 99,7% of the votes cast. Due to inflationary costs increases and, to ensure that the company continues to be the leading speciality conductive carbon black supplier in terms of product, service and quality, Imerys Graphite and Carbon enacted a general global price increase of up to 9 % for specialty conductive carbon black products as of 1 September 2017, whilst respecting all contractual commitments. The 64th PRE Congress took place in Chester/GB and was attended by around 70 participants from 14 European countries. The congress was kindly hosted by BCC, the British Ceramic Confederation. Volume 1 on "Refractory Castable Engineering" will be continued with three books (Volume 2A, B, and C) on „Corrosion of Refractories“. Volume 2A is available now. The other two books of Volume 2 will be published in 2018. Guardian Industries has approved the investment for an additional float and coated glass manufacturing plant in Czestochowa/PL to meet the growing demand for float, coated and fabricated glass products across Europe. A technical seminar on refractories is scheduled on 8–11 November 2017 at the Institute of Mineral Engineering (Gesteinshüttenkunde/GHI) of RWTH Aachen University, Germany. This intensive seminar covers the refractory industry from the raw material to the industrial application. Visitors can now register for Vitrum 2017 by completing the short form found given below. Passes for free admission to the Fair will be sent immediately to registrant’s in-box. Vitrum will take place at Fiera Milano Rho from 3–6 October 2017. The four-day event will combine displays of the most innovative technologies in the glass processing machinery, special products and accessories industries with a packed calendar of side events. The international ATHOR network is firstly dedicated to train Early Stage Researchers (ESRs) in multi-engineering fields for a better understanding of thermomechanical behaviour of refractory linings used in ironmaking and steelmaking. Through a multiscale approach, the project will cover all the main features of thermomechanical analysis of refractory linings including the influence of microstructures on material behaviour, the impact of corrosion on thermomechanical properties, the thermal shock resistance, the modelling of non-linear thermomechanical behaviours, the instrumentation of industrial vessels and the measurement of properties in operation conditions. As of 8 August 2017, Gebrüder Dorfner GmbH & Co. Kaolin- und Kristallquarzsand-Werke KG based in Hirschau/DE, aquired ACS International, based in Tucson, Arizona/US. For Dorfner, this represents another important step toward internationalization.